nevard_101027_combwich_peng_IMG_8239_web, originally uploaded by nevardmedia. 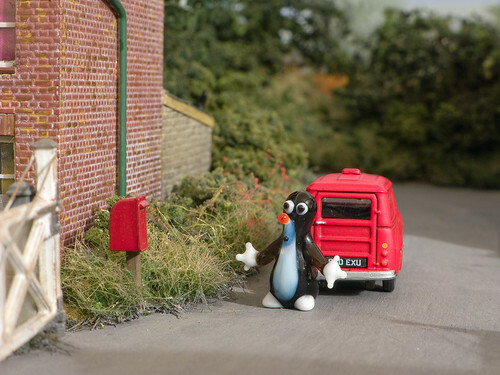 Here's Postman Penguin snapped at Ankle Bend Crossing near Combwich Station! My wife collects miniature penguins, with this one from Murano Glass being one of the cutest and smallest of all at a mere 20mm tall. This little fellow was found on Ebay and is one of around a 100 in her collection of these beaky, slippery, black & white creatures! I'm really tempted to do some more silly shots with a few more of these penguinesque fellas because they're far more fun than badly moulded and painted white metal figures that look like they've escaped from Quatermass or Doctor Who. nevard_101027_combwich_4mt_IMG_8245_web, originally uploaded by nevardmedia. 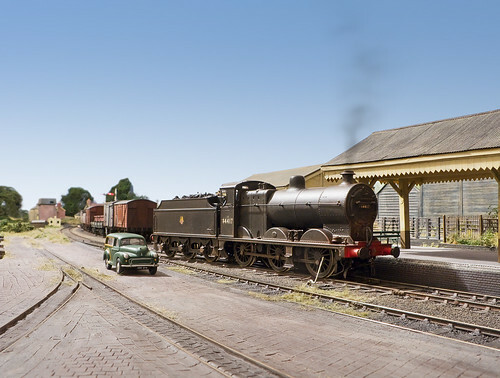 Bath shed's Class 4 Ivatt 2-6-0 has just arrived at Combwich with the mid morning working from Templecombe formed of a brace of LMS subs and an LNER Pigeon Brake Van. 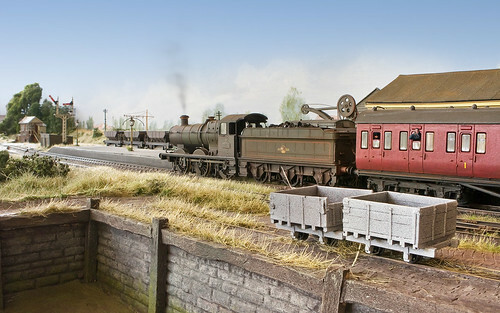 Note the trucks on the narrow gauge 2ft 3inch gauge wharf tramway. For a bigger version of the above snap CLICK HERE . It's all the rage these days to photograph model railways from a worm's eye view in an attempt to make them look more 'real', occasionally though, it's nice to get up a little higher to show off more of the layout. 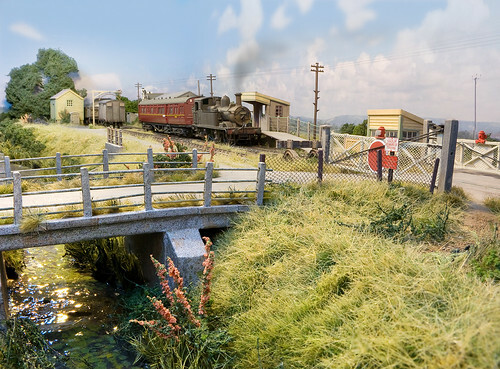 But, photographically if too elevated the backscene can start to take on an odd perspective spoiling any realism, so it's probably not the best approach if you're trying to pass off your pride and joy for the real thing. 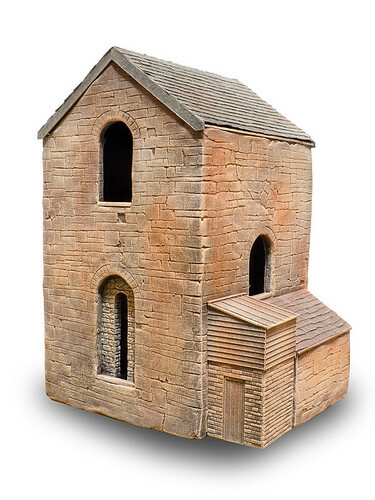 A similar problem occurs with low relief buildings if not perpendicular with the camera, with my pet hate being half low-relief houses which look very odd when the ends are not hidden by a tree or some other tall structure to hide that fact that the rear of the roof is missing. The low relief end-on warehouses seen top right in the snap above very much highlight this problem, with them looking rather odd from most angles unless viewed head on. In hindsight I'd have been better off with a bank of trees, but it wouldn't have given that mildly industrial look I was after at the time and only having 1/2 an inch depth to play with. nevard_101026_combwich_jinty_IMG_8230_web, originally uploaded by nevardmedia. 47276 arrives at Combwich with a Sunday engineering train. See a bigger version of this photo HERE! I must apologise for maybe getting a bit tardy with all these Combwich snaps, it's just that I haven't had the layout set up in the house for years! Here's another grab under the available room lighting, this time of the little 'Bagnall' arriving at Combwich with a Sunday engineering train formed of a rake of repainted Heljan Dogfish and a LNER Dia 120 4W BY Pigeon Brake Van built from a Chivers Finelines kit. Whether they ever acted as a brake on such a train I have no idea, but it was on the layout at the time and I quickly snapped and processed this shot just before going to bed last night. The cat on the ganger's hut was bought at Pendon many years ago and looks rather more like a fox that had a spell with the local chimney sweep, or at least inbibed in too much local cider judging by the angle. The SR concrete hut could be treated better now, I'm much better and doing concrete (you'll have to wait for my feature on the printed page) these days. This angle shows off the refresh with the Noch Gras Master, a fabulous tool that allows one to place hairy grass on almost any existing surface in a matter of seconds. nevard_101025_combwich_8f_IMG_8217_web, originally uploaded by nevardmedia. 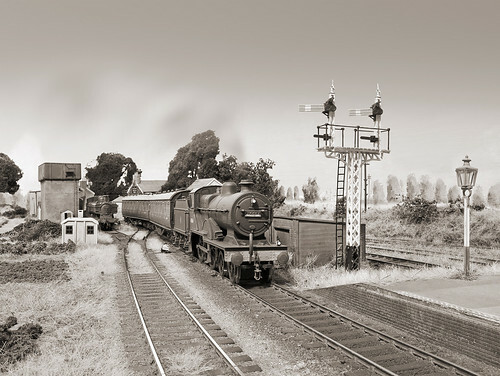 Bath Green Park's 48660 is captured shunting the sidings at Combwich in September 1962. Black 5 No. 45440 can also been seen on shed - quite what it was doing here is uknown, but it's though to have hauled a 'special' working to do with the nuclear power programme at nearby Hinkley Point. See a bigger version of the photo here! Of course the above is just aload of old rubbish - all just a bit of fun. Like with previous shots of Combwich being tidied up for Wycrail on the 6th Nov (and also Railex in May '11) this one was taken under the single 60w domestic bulb in the ceiling with a long exposure. 5 identical images focussed on key spots were combined using software to increase the depth of field. The sky; the lower section is the the actual rather badly painted backscene, the area above a little wash with Photoshop to hide the walls and windows the layout is currently residing in. nevard_101024_combwich_jinty_IMG_8191_web, originally uploaded by nevardmedia. Bull: Gently simmering away, Radstock's '*Bagnall' No. 47276 is captured resting between shunting moves at Combwich on 2 October 1965. Reality: simply taken with daylight coming through the window, the only messing about is the bit of fake clag. 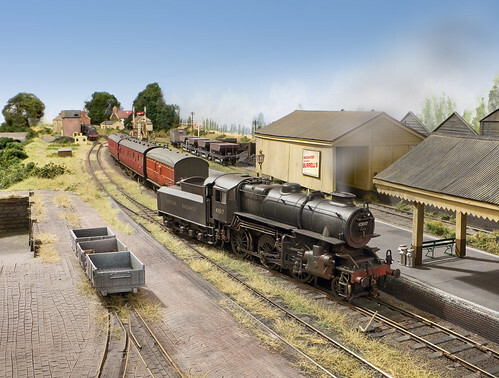 Combwich is currently set up in preparation for Wycrail on Sat 6 November. Work on the layout today involved a few tweaks to point blades and a little refresh of the scenery using a Noch Grasmaster. *A 'Bagnall' (what S&D men called a Jinty) is just a renumbered and weathered Bachmann. nevard_101022_combwich_4f_IMG_8152_web, originally uploaded by nevardmedia. Baloney caption: Under a stunning clear blue summer sky, a nicely buffed up 44417 poses next to the photographer's Morris Traveller at Combwich Station in July 1962. I woke up at 04:00 this morning in a restless state realising that Wycrail is only 2 weeks away; "so what", you say "you finished this layout years ago so there's nothing to worry about". All quite true, but the problem is that Combwich hasn't been run since 2004 at the Farnham Model Railway Exhibition. Model railways, like old cars don't like to be forgotten and ignored because they break down or at least refuse to work properly. What's more, Combwich is 30 this year, so whilst not a classic is at least an old heap with all the associated problems apart from rust. With permission from the domestic authorities I've taken over the extension and set the layout up in there. The cats are rather amused by the goings on especially seeing it's where they normally hang out at bed time. One of the first jobs was to set up the layout on Cement Quay's trestles, these are a little higher than Combwich's old ones which are now firewood. That bit worked out OK, but does mean I'll need to sort out a longer drape to mask the trestles (I'll pinch Cement Quay's and add another section). Next job was to power it all up, this bit took me by surprise in that everything works - amazing really since it has spent 5 of the last 6 years in a slightly damp garage. The last 9 months however has been in a warm house. The backscene and fascia was a little scuffed, so a slap of paint has sorted out that, matching the blue sky was a little tricky but feathering the new paint hopefully has worked to blend it in. Then the lighting rig was erected and the big nameboard displaying 'Combwich' in finest Gill Sans fixed with the aid of a hot glue gun. Return of The Titfield Thunderbolt! nevard_090503_catcott_1451_IMG_4625c_web, originally uploaded by nevardmedia. It's a little known fact that 1451 and its GWR autocoach made a trip along the old S&D between Highbridge and Evercreech one Tuesday in 1964. Here the little ensemble is captured by Hungarian photographer Draven Rehpotsirhc after a chase from Evercreech Junction. Some say it was run to shoot footage for the failed cinema release 'Return of The Titfield Thunderbolt'. More info on this little station can be found here. 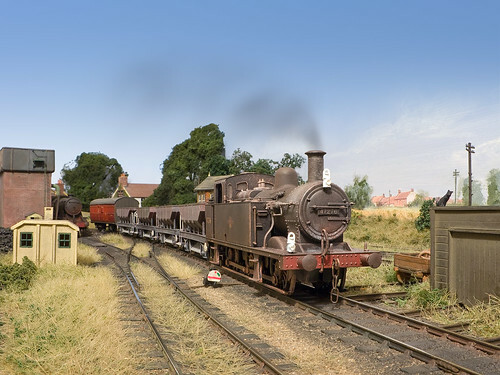 Find out about the original Titfield Thunderbolt. "Chim chiminey Chim chiminey Chim chim cher-oo!" nevard_101015_cornish_pump_IMG_8141_web, originally uploaded by nevardmedia. 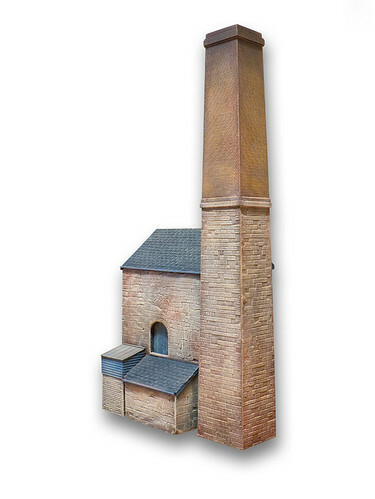 With the near completion of the long-winded cornish pump for Mendip Colliery, last night a chimney was built up from plastic sheet and earlier today a little paint splashed onto it. 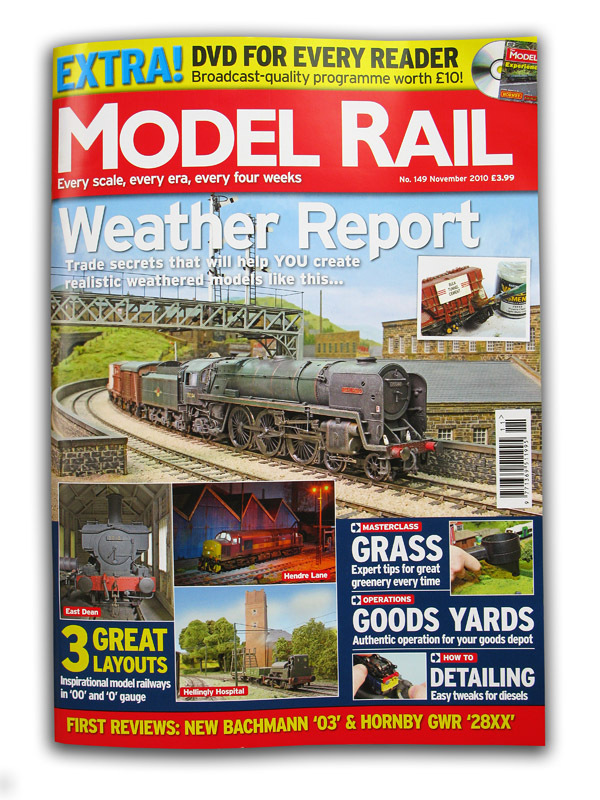 Read more about it in Model Rail Magazine in due course. nevard_101006_cornish-pump_IMG_8079_web, originally uploaded by nevardmedia. 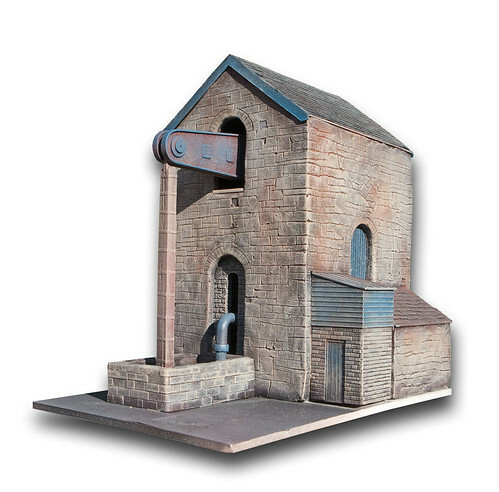 Cornish Pump Engine: Update 11 Oct 2010. Today's work included making up the beam from plastic sheet, wooden shutters and additional paintwork. Ignore the gap around the base, that will be filled when the structure is set into the ground. There is still quite a bit of detail to be added to the area below the beam. I'll post a snap in due course. 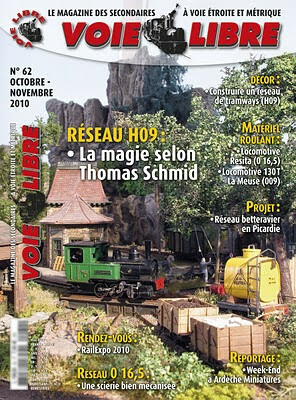 It's always a joy when from across the Channel the French railway modelling mag VOIE LIBRE pops through the letter box. 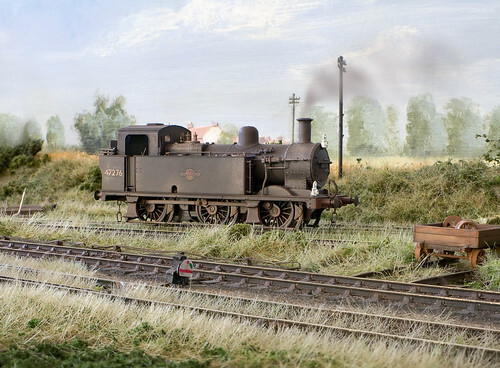 Talented editor-in-chief François Fontana has the uncanny knack of tracking down, photographing and reporting on some of the finest narrow gauge modelling from around the globe and then presenting it in a most wonderfully stylish package. The inpirational content makes me realise just how far behind many of us Brits are with this all encompassing hobby when it comes to scenics, presentation, imagination, ingenuity and above all having fun. 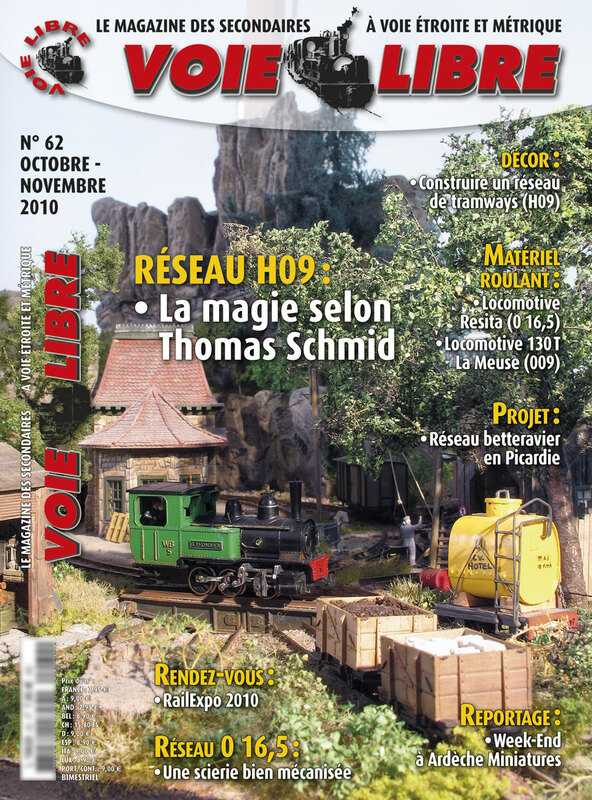 Visit VOIE LIBRE online and to download your ENGLISH translation! Disheveled looking Cornish Pump, originally uploaded by nevardmedia. Those top chaps over at Bauer Towers have been rather busy again, for Model Rail 149 is just hitting the shelves with 3 really classy railway layouts, quality reviews, a DVD(!) and of course more leading 'how doos' to take some of the mystery out of the hobby. Oh yes, and a few snaps by me..
News: First pictures of the first engineering prototype of the MR/Dapol Sentinel. Still lots of small detail and rivets to add. Plus all the regulars including Model Mail, Q&A and Backscene.